Emilio Estevez (/ɛˈmiːljɔː ɛstˈɛvɛs/; born May 12, 1962) is an American actor, director, and writer. He started his career as an actor and is well known for being a member of the acting Brat Pack of the 1980s, starring in The Breakfast Club, St. Elmo's Fire, and also acting in the 1983 hit movie The Outsiders. He is also known for Repo Man, The Mighty Ducks and its sequels, Stakeout, Maximum Overdrive, Bobby (which he also wrote and directed), and his performances in Western films such as Young Guns and its sequel. Estevez was born in Staten Island, the oldest child of artist Janet Templeton and actor Martin Sheen (born Ramón Estevez). His siblings are Ramon Estevez, Charlie Sheen (born Carlos Estevez), and Renée Estevez. Estevez's paternal grandparents were Irish and Galician (Spanish) immigrants. His father is a "devout Catholic" and his mother is a "strict Southern Baptist". Estevez initially attended school in the New York public school system but transferred to a prestigious private academy once his father's career took off. He lived on Manhattan's Upper West Side until his family moved west in 1968 when his father was cast in Catch-22. Growing up in Malibu, California, Estevez attended Santa Monica High School. When Estevez was 11 years old, his father bought the family a portable movie camera. Estevez, his brother Charlie, and their high school friends, Sean Penn, Chris Penn, Chad Lowe, and Rob Lowe used the camera to make short films, which Estevez would often write. Estevez also appeared in "Meet Mr. Bomb", a short anti-nuclear power film produced at his high school. Emilio was 14 when he accompanied his father to the Philippines, where Sheen was shooting Apocalypse Now. Estevez appeared as an extra in Apocalypse Now, but the scenes were deleted. When they returned to Los Angeles, Estevez co-wrote and starred in a high school play about Vietnam veterans called Echoes of an Era and invited his parents to watch it. Sheen recalls being astonished by his son's performance, and "began to realize: my God, he’s one of us." After graduating from Santa Monica High in 1980, he refused to go to college and instead went into acting. Unlike his brother Charlie, Emilio and his other siblings did not adopt their father's stage name. Emilio reportedly liked the assonance of the double ‘E’ initials, and "didn't want to ride into the business as 'Martin Sheen's son'." Upon his brother's using his birth name Carlos Estevez for the film Machete Kills, Emilio mentioned that he was proud of his Hispanic heritage and was glad that he never adopted a stage name, taking advice from his father who had regrets adopting the name Martin Sheen as opposed to using his birth name Ramón Estevez. His first role was in a drama produced by the Catholic Paulist order. Soon after, he made his stage debut with his father in Mister Roberts at Burt Reynolds' dinner theater in Jupiter, Florida (this was the only job his father ever placed him in). Since then, father and son worked together in the 1982 ABC-TV film about juveniles in jail, In the Custody of Strangers, in which Estevez did the casting. 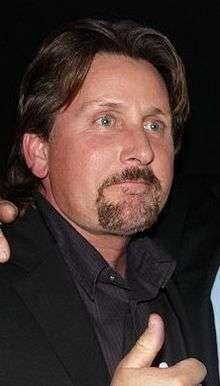 Estevez received much attention during the 1980s for being a member of the Brat Pack and was credited as the leader of the group of young actors. Estevez and Rob Lowe established the Brat Pack when cast as supporting "Greasers" in an early Brat Pack movie, The Outsiders based on the novel. Lowe was cast as C. Thomas Howell's older brother Sodapop and Estévez as the drunken Two-Bit Matthews. During production, he also approached his character as a laid-back guy and thought up Two-Bit's interest in Mickey Mouse, shown by his uniform of Mickey Mouse T-shirts and watching of cartoons. Besides his roles in In the Custody of Strangers and The Outsiders, his credits include NBC-TV's thrillers Nightmares and Tex, the 1982 film version of another S.E. Hinton story. He bought the movie rights to a third Hinton book, That Was Then, This Is Now, and wrote the screenplay. His father predicted he would have to direct to feel the full extent of his talents, describing him as "an officer, not a soldier." After The Outsiders, Estevez appeared as the punk-rocker turned car-repossessor Otto Maddox in the cult film Repo Man before co-starring in The Breakfast Club and St. Elmo's Fire. Following the success of these back-to-back Brat Pack films, he starred in That Was Then, This Is Now (which he co-wrote), the horror film Maximum Overdrive (for which he was nominated for a Golden Raspberry Award), and the crime drama Wisdom (with fellow Brat Packer Demi Moore). Estevez was originally cast in Platoon to be private Chris Taylor but was forced to drop out after production was delayed for two years; the role eventually went to his younger brother Charlie Sheen. He went on to lead roles in the comedy/action film Stakeout and the westerns Young Guns and Young Guns II. In the early 1990s, Estevez directed, wrote, and starred with his brother Charlie in a comedy about garbagemen, Men at Work. Estevez later stated, "People come up to me on the street and say, Men at Work is the funniest movie I ever saw in my life. But, you know, I do have to question how many movies these people have seen." In 1992, he found the career longevity that escaped other Brat Packers by starring in The Mighty Ducks as Coach Gordon Bombay, a lawyer and former peewee star and minor hockey prodigy looking to forget the past, forced into coaching a pee wee hockey team as a form of community service. The film turned out to be one of Disney’s most successful franchises. It was followed by two sequels. The following year Estevez starred in three films: the dark thriller Judgment Night, the spoof comedy Loaded Weapon 1, and comedy/action film Another Stakeout, which was the sequel to his earlier film Stakeout. Estevez has acted alongside his father several times. He starred in (and also directed) the 1996 The War at Home in which he played a Vietnam War veteran dealing with posttraumatic stress disorder, while Sheen played his unsympathetic father. He also guest-starred in one episode of the TV series The West Wing as a younger version of his father's character (Jed Bartlet). Estevez also appeared in an uncredited role in the feature film Mission: Impossible. From 1998 to 1999, he appeared in three television movies: the spaghetti Western Dollar for the Dead (1998), the comedy Late Last Night (1999), and Rated X (2000), which he also directed. In 2000, Estevez starred in the Moxie! Award-winning thriller Sand as part of an ensemble cast that also included Denis Leary, Jon Lovitz, Harry Dean Stanton, and Julie Delpy. In an interview a month after the 2010 Oscar tribute to John Hughes he explained his absence as publicity shyness: "I've never been a guy that went out there to get publicity on myself. I never saw the value in it." Aside from acting, Estevez has also directed television shows and motion pictures. He made his directorial debut with the film Wisdom, which made Emilio the youngest person to ever write, direct, and star in, a single major motion picture. Most recently, he has directed episodes of the television series Cold Case, Close to Home, The Guardian, CSI: NY and Numb3rs. The films he has directed include Men at Work and The War at Home. He directed the 2006 film Bobby, which took over six years to write. Producing the film nearly bankrupted him as the domestic box office gross was not able to cover production costs. The movie scored him some fans outside of the USA, mainly in Europe. He won a Hollywood Film Award and received a 7-minute standing ovation at the Venice Film Festival. Estevez has stated that he has several screenplays he has written that remain unproduced. Estevez said during an interview after one of the first screenings of Bobby that his next film would likely be Johnny Longshot. Under Estevez Sheen Productions, a Warner Bros.-affiliated company, Emilio filmed his latest project, The Way, in Spain where he directed his father in a story about a man who decides to make the Camino de Santiago after the death of his son in the French Pyrénées. It was released in the United States on October 7, 2011. Estevez appeared in John Parr's "St. Elmo's Fire (Man in Motion)" music video, from the soundtrack of his film with the same name, where he played Kirby Keger. The music video featured all seven of the main cast members of the film, looking sadly through the foggy windows of a run-down and fire-damaged version of the St. Elmo's Bar set. Estevez is a close friend of Jon Bon Jovi. He appeared in Bon Jovi's music video "Blaze of Glory" as Billy the Kid. In turn, Bon Jovi also made a cameo appearance in Young Guns II. "Blaze of Glory" was in the Young Guns II soundtrack and was nominated for an Academy Award. In 2000, Estevez made an appearance in another Bon Jovi video, "Say It Isn't So," along with Matt LeBlanc, Claudia Schiffer, and Arnold Schwarzenegger. Estevez's father Martin Sheen (born Ramon Estevez) is of half Irish and half Spanish descent, from the Galician region. Sheen is a Roman Catholic and Emilio's mother was raised a Southern Baptist, and Emilio has stated that his own religion is a "work in progress". He also revealed on his official Twitter that he is a supporter of South-East London Football Club Millwall F.C. Estevez is the older brother of Charlie Sheen and son of Martin Sheen. He had a steady relationship with Carey Salley, a Wilhelmina model, until they broke up in 1986. They share a son, Taylor Levi Estevez (born June 22, 1984), and a daughter, Paloma Rae Estevez (born February 15, 1986). He was briefly engaged to actress Demi Moore and they remain good friends. The two starred as a feuding married couple in the 2006 movie Bobby, alongside Moore's real-life husband at the time, actor Ashton Kutcher. 1 2 Drake, Tim (14 September 2011). "Emilio Estevez and Martin Sheen Talk of Faith". NCRegister.com. National Catholic Register. Retrieved 5 June 2015. 1 2 3 4 5 6 7 8 Buchalter, Gail (28 February 1983). "Emilio Estevez acts up, and no one's prouder than his father, Martin Sheen". People. Time Inc. Retrieved 26 March 2011. 1 2 3 McLean, Craig (21 March 2011). "The Way: interview with Martin Sheen and Emilio Estevez". The Telegraph. Retrieved 26 March 2011. 1 2 Ramirez, Erika (28 February 2011). "The True Identity of Charlie Sheen: Tracing The Roots of The Estevez Family". Latina magazine. Retrieved 28 February 2011. ↑ Adios Charlie Sheen, hello Carlos Estevez, CNN.com, 6 June 2013. ↑ Blum, David (June 10, 1985). "Hollywood's Brat Pack". New York: 40–47. 1 2 3 4 Kiebus, Matt (1 March 2011). "What About Emilio?". deathandtaxesmag. Retrieved 6 March 2011. ↑ Mitovich, Matt (6 November 2008). "Two Brothers to Team on Two and a Half Men". TV Guide. Retrieved 28 March 2011. 1 2 Dwyer, Fr Dave (7 April 2010). "Emilio Estevez and The Way". Busted Halo. Retrieved 17 March 2011. ↑ Clint, Caffeinated (29 July 2011). "Congrats to Emilio Estevez; The Way lands distribution". Moviehole. Retrieved 7 August 2011. ↑ Siedlecka, Jo (24 February 2011). "A father and son project: Martin Sheen, Emilio Estevez discuss The Way". Independent Catholic News. Retrieved 17 March 2011. ↑ Jackson, Laura (2005). Jon Bon Jovi. Citadel. p. 109. ISBN 978-0-8065-2600-3. ↑ Cherkezian, Megan (2 March 2007). "Designer to the Stars Fluffs Celebs' Pillows and Tells!". TV Guide. Retrieved 28 March 2011. ↑ Fleeman, Michael. "Emilio Estevez the History Boy". Wikimedia Commons has media related to Emilio Estevez.